It’s no secret that I am a Pandora fan. Not only do I like their product, but I genuinely enjoy the people that bring great opportunities to Intel to help extend our campaign messages. 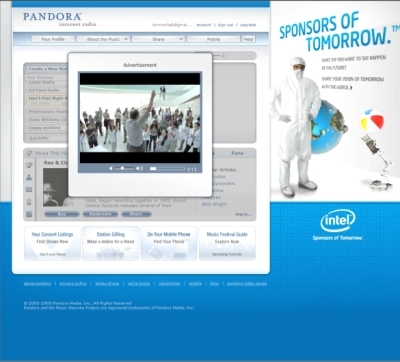 We’ve been trying to get the right thing in place to leverage the power of the Pandora listening network for our Sponsors of Tomorrow brand campaign since launch. Yesterday we finally unveiled our effort. Big kudos to the Pandora team and our agency for really working hard to make this happen – I think it will be a great activation around our new brand campaign. We did a soft launch yesterday and you’ll see us show up more and more over the next month or so as you enjoy your favorite artist streaming on Pandora.com. The visual experience you can expect is in the image below. We’ll also have some interstitial placements of our Rock Star and Oops advertisements as media within the channel stream. Great job Team Pandora! USATF Nationals just wrapped up this past weekend in my hometown of Eugene, Oregon (Track Town USA). Nike just signed on to continue it’s sponsorship of Nationals until 2013 with and option to continue through 2017, ensuring positive funding for the championship event for years to come. Thank you Nike for being such an ardent supporter of Track and Field. Here’s a little humor coming out of their creative team that was posted to their official Nike Running Blog, but will likely never make primetime TV. Tragedy is news and news the population and media vehicles flock to in overwhelming numbers. Over the last week we’ve seen that on multiple levels – from the violence in Iran around the election and the tragic death of a female protester named Neda (Warning – any video that is found through this link has the potential to be VERY graphic), to yesterday’s news about the early and unfortunate passing of two entertainment icons – Farrah Fawcett and Michael Jackson. With Neda, the young Iranian protester that is now being called ‘the voice of Iran’ (‘voice’ is a direct interpretation of her name in Persian) is the unwitting ‘face’ for the media surrounding the Iran revolution. You can’t read a story after her tragic death about the turmoil in Iran without a mention of her name or a link to the gruesome video. The social travel alone of this event has been amazing. All the major media vehicles have tapped into this story and specific event, while the social movement behind the spread of the protest has been one of the hottest trends on Twitter over the last 2 weeks. Wikipedia registered more than 650 edits to his page since the news broke and New Media Strategies notes that the daily average of 20,000 visitors to his page spiked to more than 1.8 million after the announcement hit the wire. Mashable reports that by Friday morning ”tributes to, and remarks upon, Michael Jackson’s death were responsible for 30 percent of tweets.” With the advent of social media and the tools facilitate real time sharing from any location, news of his death and arrangements for spontaneous memorials spread like wild fire – with fans coming together to mourn and pay respects to a music icon. Neda, Farrah, Michael – rest in peace – you will be missed by many and forgotten by few. Pogue goes on a sarcastic bent regarding customers having to do ‘extra’ research on their purchase by leveraging the independent tests and reviews that clarify battery life claims. Interesting commentary. Personally, when I am making a technology purchase of a significant dollar value – I spend plenty of time researching, and am happy to do it in order to make sure what I am getting is passing muster. Maybe we should recommend a good search engine to Mr. Pogue to make his research easier so he is happy with the product claims he is getting from the spokespeople he talked with for this article. I travel for my job – lucky for me, I get to go to interesting places. Whether I am flying to New York to participate in a social media summit, heading down to North Carolina to meet with a customer or spending time in the Windy City with my agency, I am constantly taxing the limits of the technology I use for my job. Smart phone – check, laptop – check, data card – check, iPod – double check (well, this isn’t really job related but a guy can’t work ALL the time now…). The 3 things that I worry about most, in this order are: battery life, connectivity, and form factor (including weight). If I don’t have good battery life, my ship has sailed – I’m not getting any work done on those long flights across country. Clearly, working for Intel gives me some perspective on this matter as we focus on battery life as one of the key differentiators in our processor line. We’ve recently announced a new family of processors that will power the next generation of ultra-thin notebooks. Now, rather than focusing on turning your screen brightness down, disabling your wireless antenna while not connected, and frantically searching for a power outlet during layovers to get enough juice for the next segment, customers can be confident that they are choosing a notebook that will help ensure they enjoy their computing experience for longer periods than ever before. Now, which notebook to choose? The customer that I met with this week was Lenovo. Last year they released the first instantiation of their ultra-thin lineup in the X300 – a competative PC answer to Apple’s Mac Book Air. This year’s addition to the lineup is the T400s. Gizmodo does a comprehensive review of the notebook and from talking with the good people in Cary, NC (US Headquarters for Lenovo) they are pretty confident that this will be a best seller in their family of products. Standard on this machine is an Intel Core 2 Duo processor (as an Intel employee and share holder, I think you for that). In addition, there is the option of embedded WiMAX for connectivity in the cities (currently Baltimore, Portland, and as of June – Atlanta) that are on the Clear WiMAX network. As a data card user while traveling and a modest user of WiMAX in my home town of Portland, having embedded WiMAX capabilities is a bonus. Now the trick is expanding that network beyond the handful of cities. In addition, this is a notebook that has definitely undergone a serious design stress test. Lenovo did a great job in analyzing how their machines are used by the clientele they cater to and realized that design definitely matters. Choosing not to stray from their signature matte black shell, they instead focused on things like ‘supersizing’ keys users touch more often (ESC and Delete), better integrated tools for Voice over IP calls, and an optional solid state drive for data security. All good decisions in my book. I’d like to get my hands on a T400s to try out for a while – it has to be an upgrade to my nearly 4 year old X60s which, while tiny, definitely forces me to sacrifice some things – like battery life and an optical drive. Yes – I’m that guy you saw searching for the power outlet in RDU and PHX last night so I could kick out the emails I did on the plane during my flight home. With an ultra-thin notebook powered by our new processor line, I imagine that my 6 hours of flying time would be productively spent without a care in the world about battery life. Is Twitter changing your everyday life? As a follow on to our Sponsors of Tomorrow effort, we (Intel) are clearing up the confusion around our processor brands. This week we announced our new brand structure and refined our strategy around a new, focused, ‘hero’ client brand – Intel® Core™. There will be three levels of Core ‘modifiers’ that differentiate the various features and benefits native to each level of Core. Joining the current instantiation, Core i7, will be an entry-level (Core i3) and a mid-level (Core i5) modifier to round out the Intel Core family. Our VP of and Director of Corporate Marketing, Deborah Conrad, explains this transition to Core as our hero client brand in a video posted to intel.com. Ok – admittedly, I am just ramping back up in the digital universe after being on holidays for the last two weeks. I did find this as an appropos way to re-enter the V/Speak blog and add a little humor to the new week. Enjoy.